CRL Concealed Leaf with Lip for 1-3/4 Inch Entry Door Roton Hinges are made of high strength aluminum with a full length rolling gear profile to align doors perfectly from top to bottom. Special self-lubricating polyacetal load bearing blocks deliver smooth, almost floating operation on even the heaviest doors. Hinges are completely secure because all mounting hardware is hidden when installed. Hinges are easy to install and come with instructions and all necessary hardware for mounting. Available in clear satin anodized or dark bronze duranodic finishes. These Standard Duty Hinges are stocked in lengths of 83 inches (2.1 meters) and 95 inches (2.4 meters). 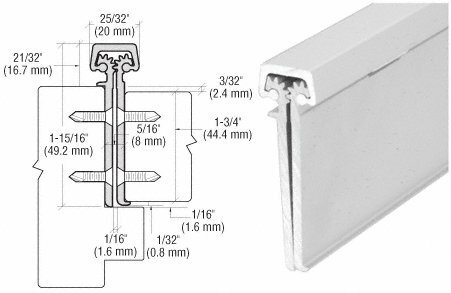 Hager 1279B0045004526D00N Aluminum/Stainless Steel Commercial Grade Hinge, 4.5" x 4.5"